Description: You are a fashion engineer. A colorful fashionista armed to the teeth with style, smiles and a closet a mile wide. Dress this doll in a one of a kind look never before seen! Instructions: Use your mouse to click on and through the floating clothing, hair, accessory and background options. It's summer time! Our girl has to wear something fashionable and stylish for this summer. Can you help her out and choose the most suitable outfit for her? She's waiting! Have fun! 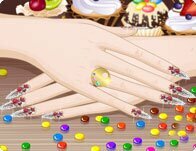 Decorate your digits with decals, paint, and gems! Let the fashionista in you extend all the way to your fingertips! Create new looks everyday, then dress up this stylish hair stylist!